A British Broadcasting Corporation (BBC) film, broadcast on Thursday evening, has presented the first direct evidence of Wiltshire Police Detective Sergeant Nick Bailey, the investigating officer who inspected the home of Sergei and Yulia Skripal about eleven hours after they were exposed, allegedly to the nerve agent Novichok sprayed on their home’s outside door-handle. Bailey’s testimony corrects some of the British press misreporting and internet speculation about the circumstances of his exposure. But Bailey’s statements, along with other claims broadcast by the BCC, raise new doubts; they settle none of the key forensic questions of who delivered the poison; where Bailey and the Skripals, Sergei and his daughter Yulia, were exposed; what the poison was and where it came from. Importantly, Bailey’s description of his symptoms leading to his hospitalization bears almost no resemblance to the symptoms of the Skripals, and of the Salisbury couple , Dawn Sturgess and Charlie Rowley, who were hospitalized in Salisbury for exposure to Novichok on June 30. Sturgess is the only one of the four victims who died. The BBC’s interviewing of the chief police officer leading the investigation, Deputy Assistant Commissioner Dean Haydon, also exposes two vital pieces of evidence for judging the credibility of the British Government’s charge that the poisoning was a Russian state operation carried out by agents of Russian military intelligence, the GRU. Haydon does not claim, and the BBC fails to show, any CCTV evidence that the two alleged GRU assassins, Ruslan Boshirov (Anatoly Chepiga) and Alexander Petrov (Alexander Mishkin), came directly to the Skripals’ home to administer the poison to the door-handle. Instead, Haydon acknowledged there may have been others – one or more – in the poison attack. The 59-minute film bills itself as the “inside story” of the Skripal case, almost ten months after the March 4, 2018, incidents in Salisbury. The BBC’s print report can be read here. Watch the film here on BBC I-player by clicking. For the most detailed analysis available and for a point-by-point forensic challenge to the British police and media versions of the case, follow Rob Slane’s Blogmire coverage. For additional analysis of what the publicly displayed evidence, including Yulia Skripal’s statements, mean according to British legal standards, read this. Det. Sgt. Bailey has not spoken in public since the March 4 incidents. His appearances in the BBC film indicate that about four hours after the Skripals were hospitalized, Bailey discussed the case with fellow officers at their station. Bailey then decided, he now says (min. 03:51) “I will have a wander down there.” He was referring to the park bench in the centre of the town where the Skripals had been found. According to Bailey, “there was nothing around the bench we could see.” Bailey was at the scene at about 8 pm, according to the BBC. Four hours later, after the police had identified Skripal, Bailey and two other policemen went to the house (min. 06:48). They donned “full forensic suits”, including gloves and face masks. Bailey says he was the first of the three to enter the house; the BBC film reconstruction shows just two men entering the house and shining torches. Bailey reports “the house was in darkness. It just looked normal. There was nothing untoward”. The police trio then left the house, took off their forensic suits, “bagged them up”, and returned to the police station. Bailey describes feeling initial symptoms of sweating and pin-prick pupils. He says he returned home that night, early Monday. He was not hospitalized until the next day – more than 24 hours later. There are two major questions from Bailey’s testimony. Although two other policemen entered the house, also in forensic gear, the movements of the other two, including their contact with the outer door-handle and with objects in the house, have not been disclosed. The implication is that they have suffered no symptoms. Whether their kit has subsequently revealed traces of the same poison as attacked Bailey is bound to be known to the police; it has not been revealed by the BBC. Nothing in Bailey’s statements to the BBC indicates that he believes he was contaminated by the door-handle. That is the theory of the policeman heading the investigation in London, Commissioner Haydon. Left: Detective Sergeant Nick Bailey, Wiltshire Police; right, Deputy Assistant Commissioner of the Metropolitan Police, Dean Haydon; for more details on Haydon, read this. Asked how he believes he could have been exposed, Bailey says (min. 31:21): “I don’t know whether it’s gone through the gloves. I could have adjusted my face mask.” No evidence of the subsequent analysis of the gloves, inside or out, has been disclosed. Haydon was not asked to explain. Haydon also presents his account of the poison on the door-handle as his theory of the crime. 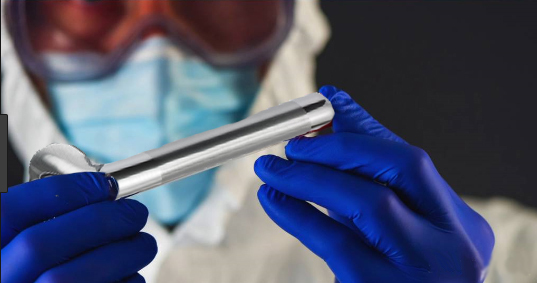 At no point in the film does Haydon, other police, the intelligence services spokesman, or “Professor Tim”, the BBC’s expert from Porton Down, the Defence Science and Technology Laboratory, identify their evidence that the door-handle or another object at the Skripal house was contaminated. Instead, the Porton Down spokesman says (min. 09:32): “we identified that the material was a nerve agent called Novichok.” The “material” isn’t in any identifiable chain of evidence required by standard British criminal investigation and prosecution. It appears to have been found by Porton Down analysis of the blood samples taken from the Skripals and Bailey at Salisbury Hospital. The BBC reconstruction now claims the Skripals were at home on the Sunday afternoon, March 4, when the poison was applied to their outside door-handle. The BBC also claims the Skripals left their house at 1:30. Although all published expert evidence about Novichok indicates it is deadly and fast-acting, there is no explanation by the BBC film of the three-hour interval after the Skripals left home, before they showed symptoms; nor of the 11-hour interval before Bailey was first exposed. Also, Bailey confirms it was more than 24 hours before his symptoms deteriorated to the point where he and his wife decided to go to hospital. There are also serious discrepancies between the symptoms of Novichok reported for the Skripals and the later victims Sturgess and Rowley, and those which Bailey reports for himself. 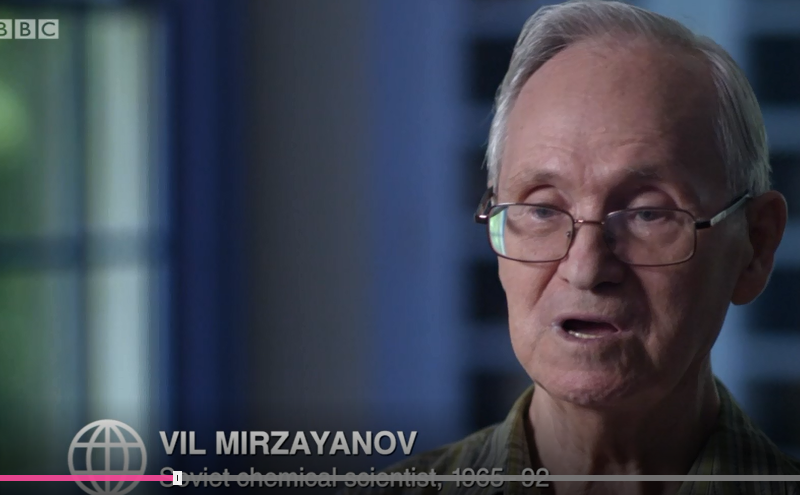 Vil Mirzayanov, the Soviet researcher who claims to have been the developer of Novichok in the 1980s, before he moved to the US, enumerated the symptoms for the BBC. They start, he said (min. 12:00), with sudden blindness, followed by difficulty breathing, then constant vomiting and “uncontrollable convulsions”. Source: https://www.bbc.co.uk/ -- min. 12:00. Witnesses in the Salisbury city centre who responded to the Skripals in collapse, confirm most of these symptoms. A friend of Sturgess and Rowley, who witnessed Sturgess being taken from her home by ambulance men and was present when Rowley fell ill, told the BBC both were foaming at the mouth and displaying convulsions. Bailey’s symptoms, according to the account he has given, were none of these. The BBC has labelled its version of the attack a “reconstruction” using actors, props, and film shot in Salisbury spliced together. The BBC voice-over claims “it is CCTV that unlocks the mystery of who tries to kill [Sergei Skripal]”. Haydon then tells the BBC the police had combed through more than eleven thousand hours of CCTV. He also claims this process achieved a “gotcha moment of – we identified the two attackers. We were now on to them” (min. 43:24). 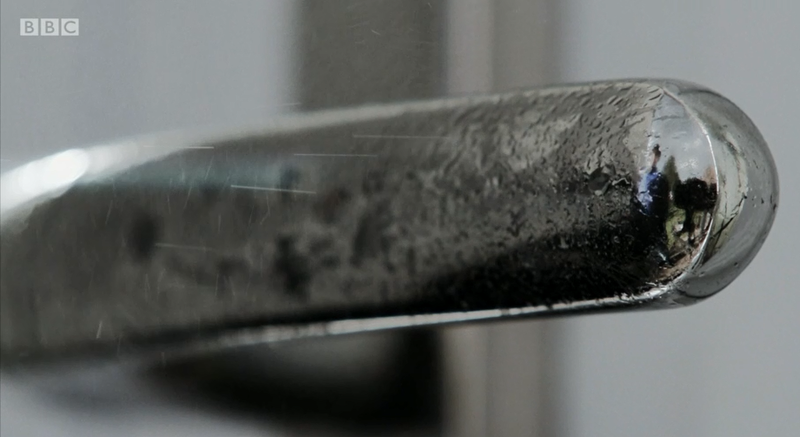 The film claims to show the Skripal door-handle being sprayed with Novichok from a dispenser made to appear to be a perfume bottle (Min. 44:54). Haydon for the Metropolitan Police does not claim to have CCTV evidence of the alleged attackers at the Skripal house or on their street. He says: “these two individuals were around where the two Skripals actually lived” (min. 43:30) – he doesn’t say when; he doesn’t show the pictures. The BBC displays one CCTV picture of the two Russians “on the way to the Skripals’ home”, according to Haydon’s commentary. The frame’s time identification shows it was then 11:58:49. If Haydon’s evidence is accurate, that is more than 90 minutes before the Skripals suffered the alleged attack. 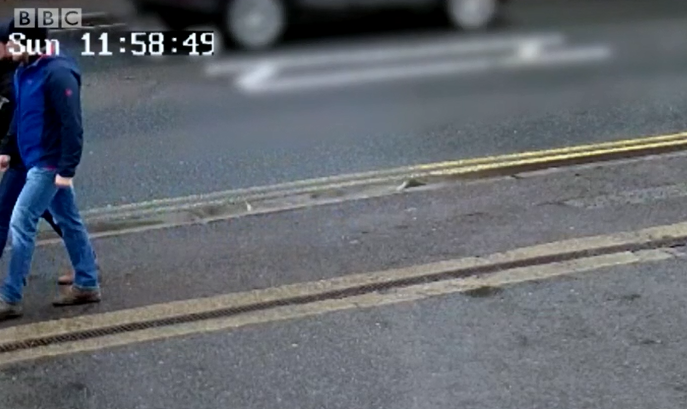 Multiple independent calculations reported from Salisbury place the location of this CCTV image at less than 5 minutes’ walk from the Skripal house. If the BBC reconstruction is accurate, the attackers were arriving at the scene of the crime much too early. At that time, the alleged assassins were risking detection for themselves and discovery of their weapon; or if they arrived early and got clean away, the dilution and loss of lethal effect for their poison. According to Haydon, “they would have been there for, literally, a matter of seconds” (min. 45:05). Earlier British press reports have quoted their police sources as claiming that “about an hour after the attack, at 1.05pm, they [Russian attackers] were in the city centre on Fisherton Street, according to the British authorities.” The BBC version of Haydon’s evidence doesn’t identify when the door-handle was sprayed. In the BBC reconstruction of the crime, the Skripals were contaminated at 1:30, as “father and daughter head out for lunch” (min. 45:13). It is now uncertain whether the poison had been on the handle for an hour or more. Haydon’s commentary is that “ Sergei came out first of all; he got Novichok on his hands [plural], and then Yulia came out second, and then she also got Novichok on her hands [plural]” (min. 45:00). Source: https://www.bbc.co.uk/ -- min. 45:15. In the reconstruction, the Sergei figure is bare-handed when he touches the outside door-handle to close the door. The Yulia figure doesn’t touch the handle and appears to be wearing gloves.